1 How to Apply SSC Result Rescrutiny 2019 by SMS process? SSC Rescrutiny Result 2019 & Apply System! The SSC Exam Result 2019 published on 4th May, 2019. After publishing the result, the failure students are eligible to apply for SSC Board Challenge 2019 or SSC Rescrutiny 2019 or SSC Puno Nirikkhon 2019. In this short article I am showing how to apply SSC Rescrutiny 2019 and check SSC Rescrutiny Result 2019. There are two ways to apply and Re-check your SSC Result 2019. Their name SMS and Online System. All the SSC 2017 Examine are available to re-check their Result from 5th May, 2019 to 11th May, 2019. If you want to know more or apply SSC Result Rescrutiny 2019, just follow the below article. How to Apply SSC Result Rescrutiny 2019 by SMS process? This is very easy to apply SSC Rescrutiny 2019 by SMS system. Just follow the 2 step message system. RSC<space>First Three Letter of Board Name<space>Roll No<Space>Subject Code and send to 16222. General Education Board: RSC<>space>DHA<space>10345<space>123 and send to 16222. Madrasah Education Board: RSC<>space>Mad<space>15345<space>123 and send to 16222. Technical Education Board: RSC<>space>Tech<space>17345<space>123 and send to 16222. After sending this message, where he/she know how much money need for this application process. After the examine paying full amount, Examine will get a PIN number for the last task. The application will charge you 125 Taka Only. If your doubt subject has 2 two parts, you will charged 250 Taka Only. You can check the Multiple Subject in one SMS by separated Coma (,) subject code. 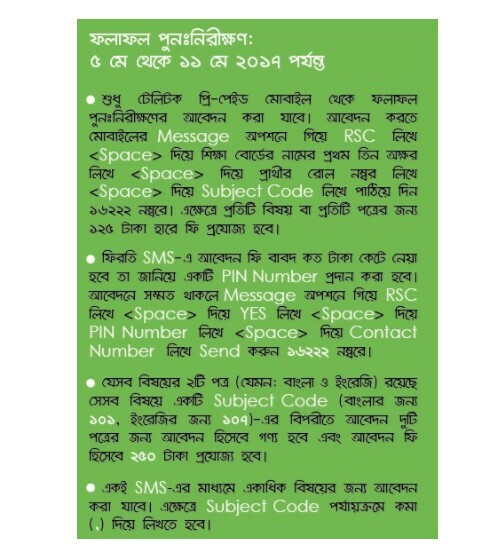 RSC<space>YES<space>PIN number<space>Contact Number and send to 16222. Example: RSC<space>YES<space>654321<space>01710000000 and send to 16222. Are you searching How to check SSC Rescrutiny Result 2019 Dhaka Board, SSC Rescrutiny Result 2019 Rajshahi Board, SSC Rescrutiny Result 2019 Jessore Board, SSC Rescrutiny Result 2019 Sylhet Board, SSC Rescrutiny Result 2019 Chittagong Board, SSC Rescrutiny Result 2019 Barishal Board, SSC Rescrutiny Result 2019 Comilla Board, SSC Rescrutiny Result 2019 Dinajpur Board, SSC Rescrutiny Result 2019 Technical Board, SSC Rescrutiny Result 2019 Madrasah Board? If yes, no tension. When the SSC Result Rescrutiny 2019 published, you get results from our website. Thanks for staying with us a long time and visiting SSC Rescrutiny Result 2019 & Apply System article. If you have any confusion or question or want to know more about the SSC Rescrutiny Result 2019 & Apply System, just comment the below box. We reply as soon as possible.